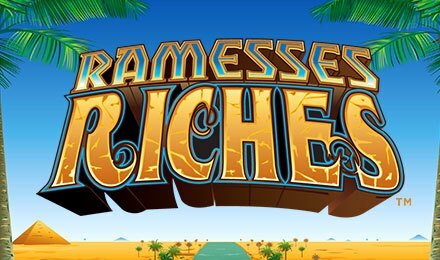 Ramesses Riches slot is a 5 reels and 20 paylines slot game, themed on the Ancient Egyptian times. King Ramesses was the longest ruler of Egypt, who took the throne for 67 years and lived up to 96 years old. Enjoy living under his ruling at Wicked Jackpots Casino, where you have the chance to bag up amazing prizes on the features and bonus rounds available in the game. Adjust your stakes on the Bet Field, using the plus or minus buttons on Ramesses Riches slot. The Line Field is a game option, that allows you to change the amount of paylines you would like to place your bets on. Click on the Spin button to get the game started once you’re done setting your game options. Make use of the Autoplay option and use it to your advantage by setting game sequences to play automatically. Amount of Paylines Selection: Set paylines from 1 to 20 to play. Coin Values: Stakes can be selected from £0.01 to £1.00. The wild symbol takes form of Ramesses himself. The wild icon helps make up winning combinations by replacing other symbols, and when this happens, the outcome of that spin is multiplied by two! The scatter symbol is Ankh, which triggers the bonus round of Ramesses Riches slot. The Free Spins Feature is triggered by landing three or more Ankh symbols anywhere in view. Three scatters award you 12 spins, four scatters award you 16 spins and five scatters award you 20 free spins. All wins generated from this feature are multiplied by 3x stake multiplier. The gamble option becomes active on a win spin. Click on the “Gamble” button and you get to select red/black bet or Suit Bet. Red or black doubles your wins, while choosing Suit Bet allows you to quadruple your bets.